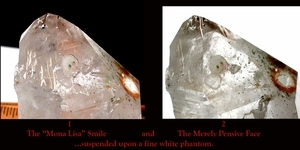 An Arkansas rock crystal variety white phantom [rarest]which also has green, tan and white chlorite inclusions. Two ROUND [selene, like the moon] inclusions [extremely rare], one with a glittering halo effect and a FACE. An obvious face. Even beyond extremely rare: truly sui generis...one which is of its' own kind. [Also]Isis faced, with a clearly naturally etched tortoise or turtle. A rainbowed, foil/inner fracture three dimensionally shaped shows the astrological Aries sign and/or the sign for Pi. The back prism side, curved from interrupted growth, and a partially regrown growth crater one prism over fits the crystal comfortably in your hand. It tabularly stands alone [and also physically] on a milk quartz base also in regrowth, 11/16x 3x 4-1/16" tall - though laying down you can read through the clear top half. Four tip fleabites being tended to by numerous raised record keepers [to 3/4"]. Devic veils and a curved 1/8x 1/4x 1/2" doubly-terminated tabular crystal accent. This crystal stopped us in our tracks when it came out of Sonny Stanley's collection in 1994 - we can only guess what it will do to you!